Under an old cedar tree, I marked out my first garden. I used the lasagna method to make the flower bed. I planted shade-loving plants. The 'after' photo is the exact area he is 'tillerating' in the previous picture. 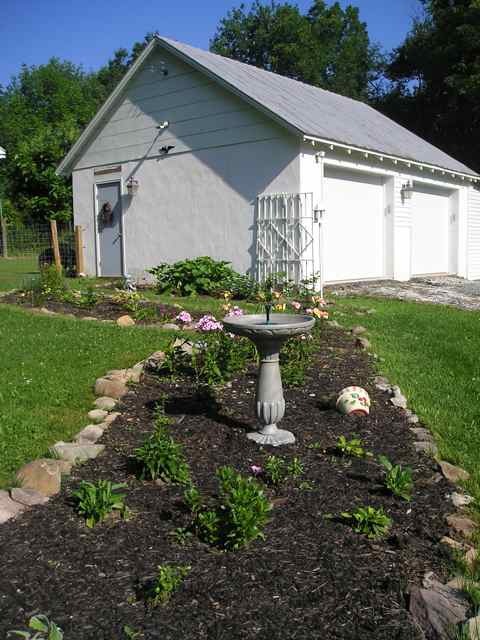 The picket fence was added much later. The fence is around the kitchen garden. The same 'tillerated' area from a different angle. The potting shed was installed first. 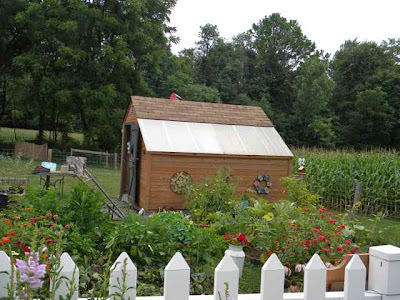 The kitchen garden was planted around it. 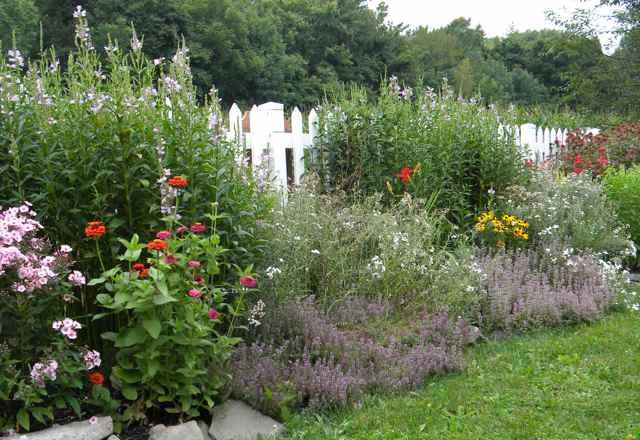 Herbaceous border along the kitchen garden's picket fence. H.H. 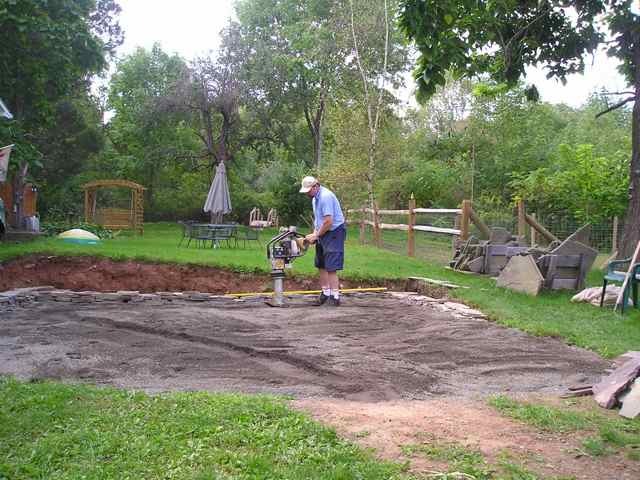 used a machine to tamp down the base of the patio which consisted of crushed stone and sand. 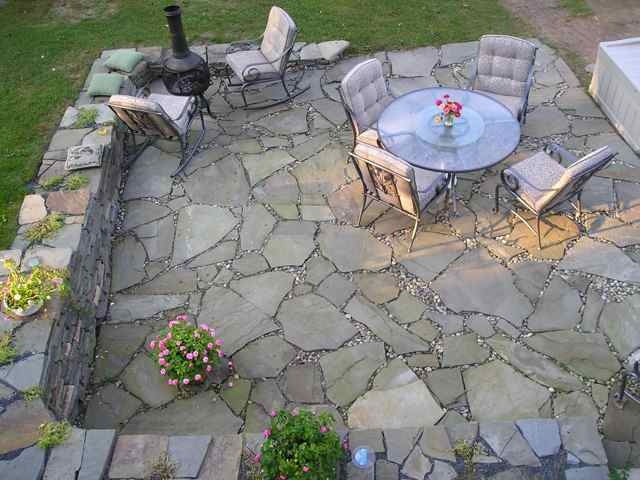 I put the slabs of Pennsylvania blue stone in place ... H.H. helped by lifting the heavier ones. I built most of the dry stone wall. Making the patio and wall was like completing a giant jigsaw puzzle. H.H. made the woodland walk by clearing invasive plants out of the old, disused orchard. He discouraged the return of the invasives by planting 50 to 100 white pine seedlings. 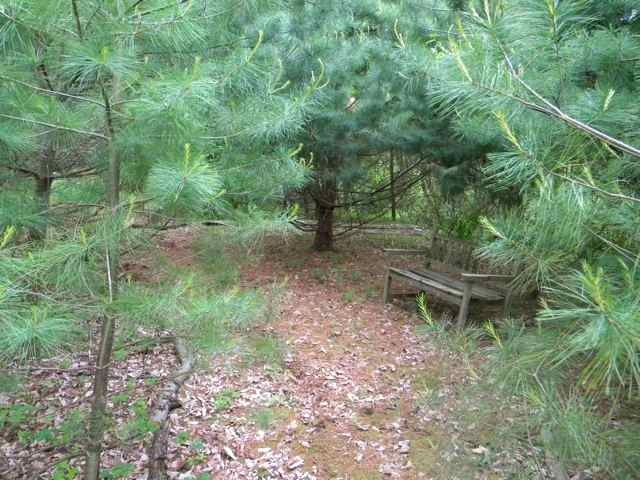 The white pines are now fully grown, and while he still needs to do battle with the invasives every spring, the pines create a very pleasant ambiance with the old apple trees, pear trees, walnuts, white birches and sassafras. Foxgloves are one of the few flowers the deer do not eat in the woodland garden. 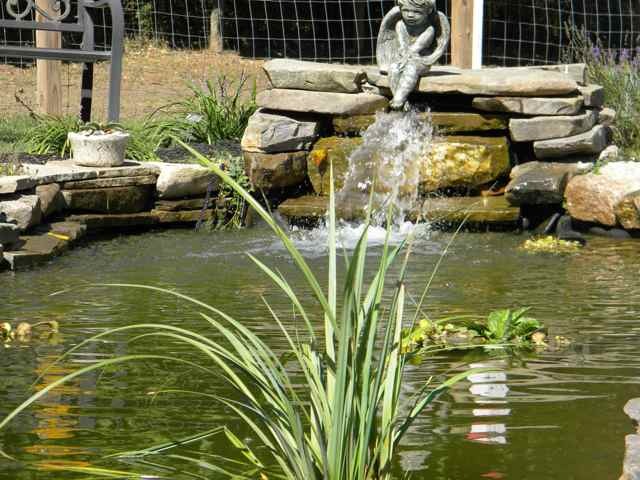 The fishpond is our latest addition. You can read how it was installed here. I do hope the fish survive the winter because the grandchildren chose them and named them. There are koi in the fishpond. "I hope to document the step-by-step progress I make toward realizing my dreams, but I find it a little scary putting myself, and what I hold dear, out there for all the world to see. I look forward to receiving your comments, and hopefully your support, as I begin this new venture." After three years, it is not so scary any more, because of all the wonderful support I receive from my dear friends around the world. 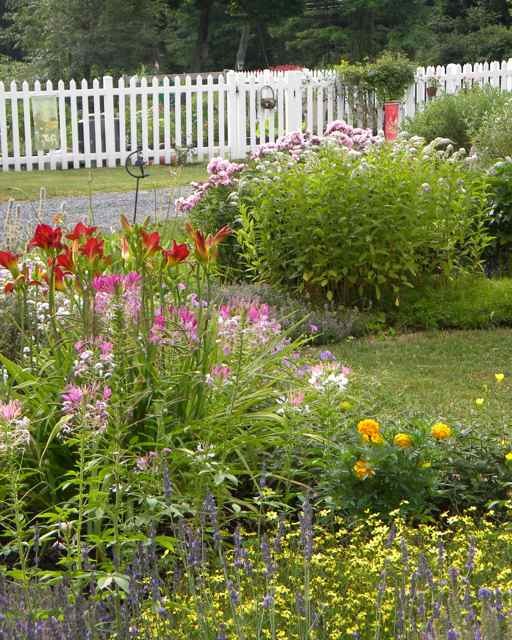 The community of garden bloggers is very special! Thank you everyone! 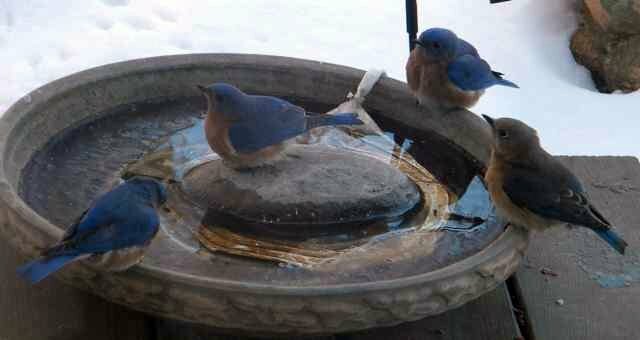 Bluebirds on the heated water dish this morning. 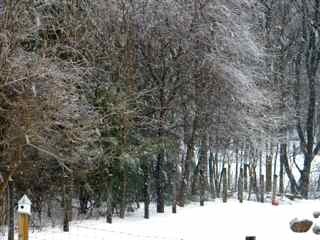 ... before my (over) protective husband 'suggested' it was far too icy, cold, and downright dangerous to be outside. I knew he was right (darn it) as there is still a thick layer of ice on top of a foot of snow covering much of the garden, so I reluctantly came inside. I took some pictures of my Zeezee plant instead. Now I am not very good at growing houseplants, but I must tell you that this is about the easiest of all. 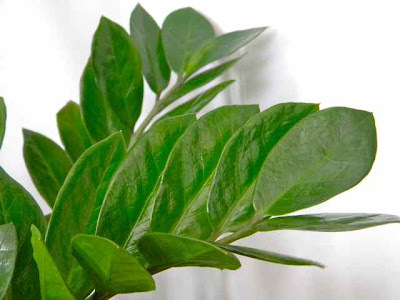 I love the zeezee plant's waxy green leaves. The glossy green leaflets are arranged along upright stems, giving the plant a tropical look (not surprising since it originated in Africa.) The zeezee grows 2 - 3 feet tall and wide. This plant grows best in moderate, indirect light, but does not seem to mind a darker spot ... mine is situated in rather low light. 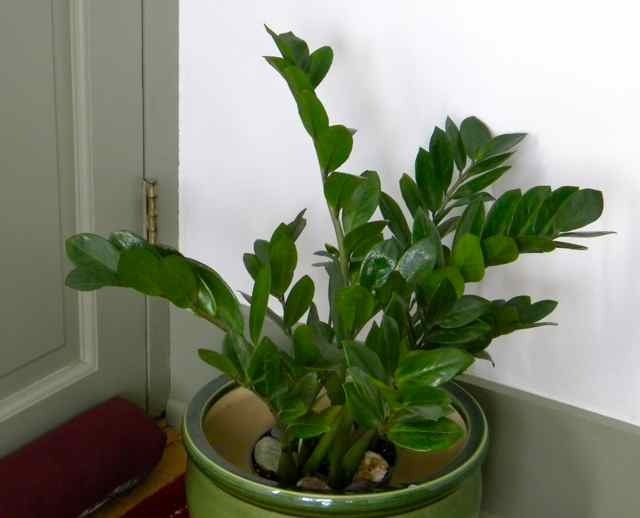 The zeezee has rhizomatous roots that store water, so I do not water it very often as it likes to dry out between waterings. I don't let the pot sit in water or the plant could rot. 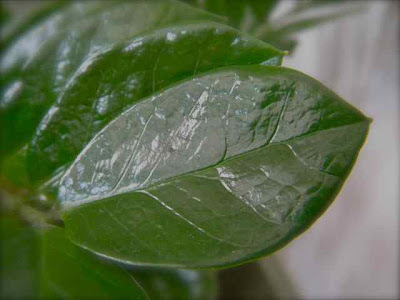 The growth rate of the plant depends on how much light and water it gets. 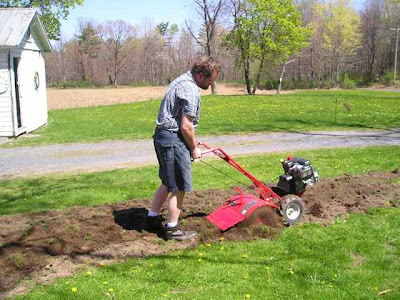 I have never fertilized my zeezee in the three-or-more years I have owned it, but a liquid fertilizer once a year would probably be beneficial. Another great feature of the zeezee is that it is not prone to pests! 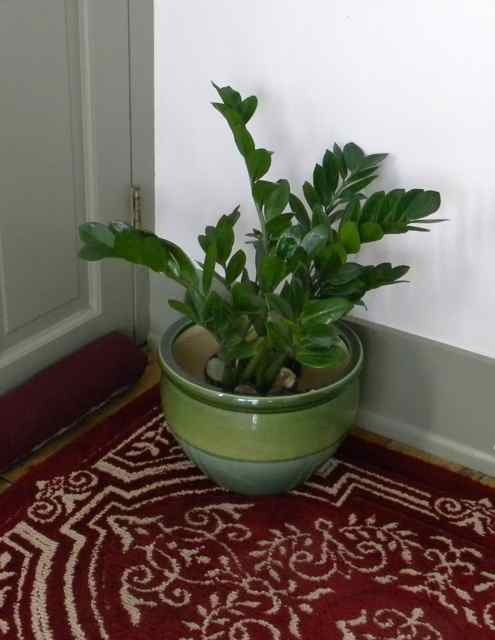 This is a great passalong plant because it is super easy to propogate. Just cut off a leaf and stick it in a pot of potting soil and perlite. Mist the soil and put the pot in a sealed plastic bag. Place it in indirect light and remove from the plastic bag when the roots form. The dragon wing begonia is is a cross between the angel wing and wax varieties and combines the best qualities of both. 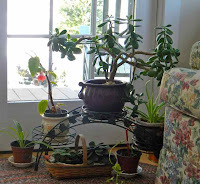 I brought this one indoors to overwinter and these pictures were taken when I first brought it inside. 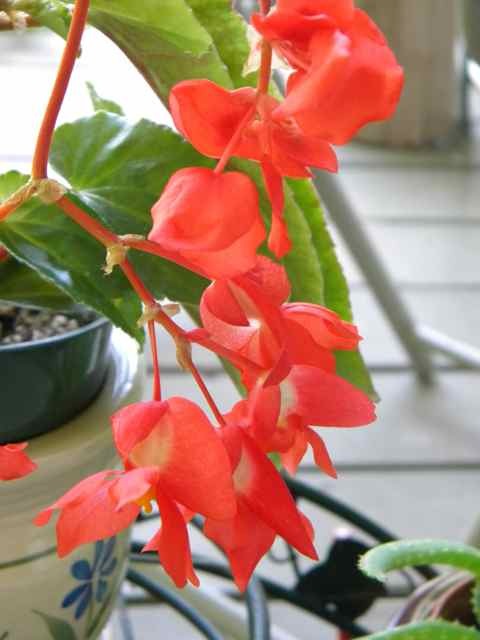 It is going dormant now, but in early summer I will place it in a hanging basket on the porch. 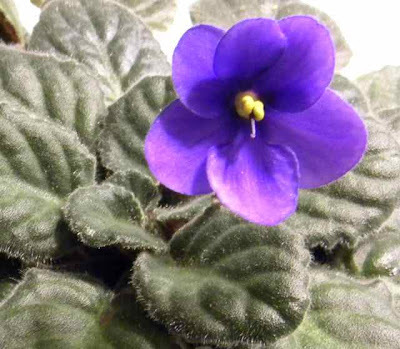 The African violet is a very satisfying plant I think, but neither the begonia or the African violet are as easy as my zeezee. 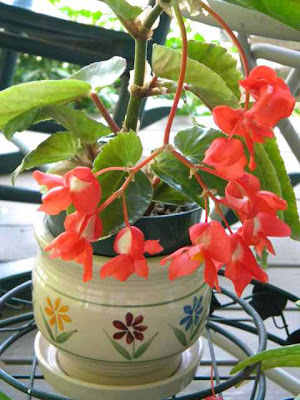 The zeezee is notable for it's resilience, and tolerates conditions that other plants will not. This makes the zeezee great for new gardeners, or gardeners like me who tend to neglect their houseplants. Now I am heading over to May Dreams Gardens to thank Carol for hosting this wonderful meme. I can't wait to see what is blooming in other parts of the world. Hopefully, by the 15th of next month the snow and ice will be thawed from my garden and I'll find some signs of spring to share with you. I hope you all had a LOVEly Valentine's Day, yesterday! 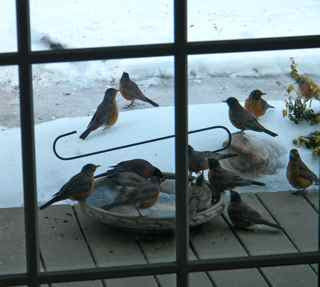 A flock of robins flew into my yard today on an icy-cold gust of wind. There were a dozen or more of these neighborly birds. 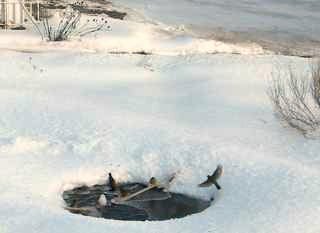 They gathered around the fishpond in the spot where the water is kept thawed by a small heater and a bubbler - both installed to keep the fish alive. I thought they were rather far north for the time of year. 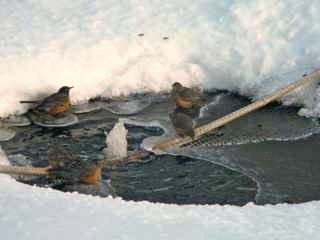 A visit to the Great Backyard Bird Count site revealed that robins are not commonly found at this time, but when they are it's typically in flocks. I was happy to see them because here, as in other parts of the country, the local folk acclaim them the official harbingers of spring. 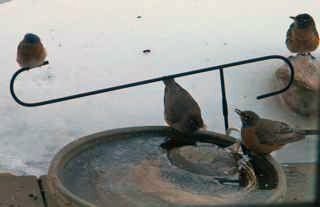 My intrepid visitors soon found the heated birdbath on the back porch. They dominated the dish for a couple of hours, joined occasionally by some of the regular guests. I wonder what they are saying to each other? Of course, the REAL robin is the European Robin, Erithacus rubecula, Britain's National Bird. 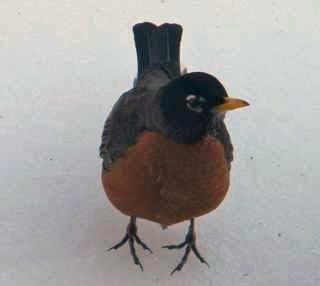 This perky little red-breasted European robin is an Old World flycatcher, whereas the American robin belongs to the thrush family. 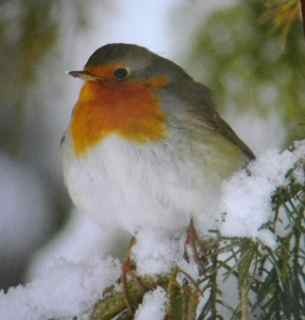 I found a great posting by Charlie on the blogging community '10,000 Birds' about the European robin and the folk laws surrounding it. My family and friends in England know how much I miss the little robin and so they traditionally send me a “robin” card for Christmas. 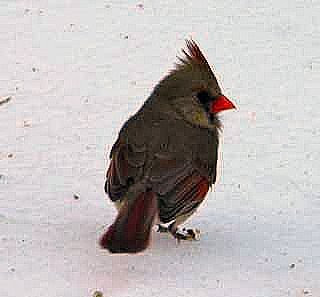 When the American robins had left my garden this morning, there were still lots of other birds for me to enjoy. 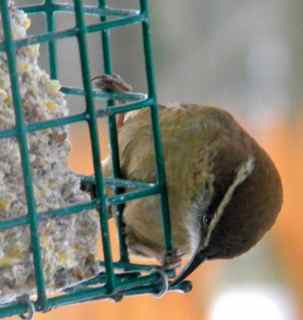 Of course, there were the usual chickadees, dark-eyed juncos, titmice, sparrows, and woodpeckers. There was also a pair of mourning doves, but they didn't stay long enough for me to take their picture. 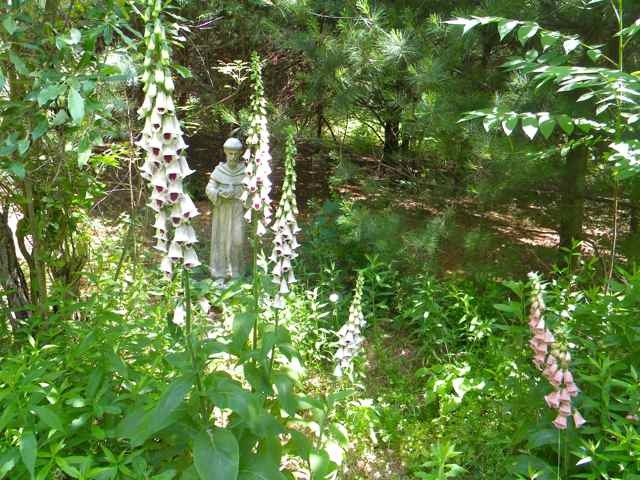 Carolyn of This Grandmother's Garden just did a great posting on mourning doves. 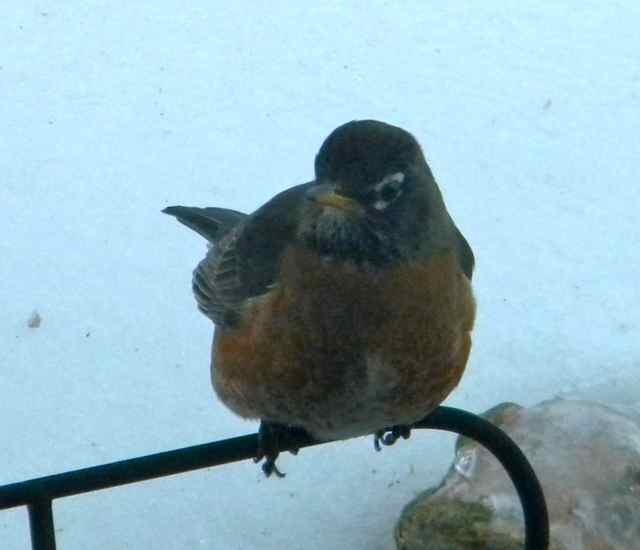 I feel blessed to have so many wonderful birds to brighten my cold, winter days. 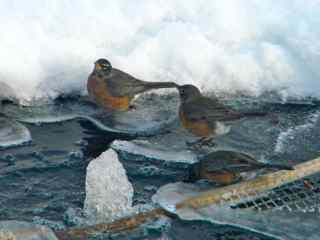 But maybe spring is not so far away ... if the American robin is to be believed! I remember as an English school-child learning Shakespeare's ode to winter. Reading about Tom and Greasy Joan intrigued me back then. 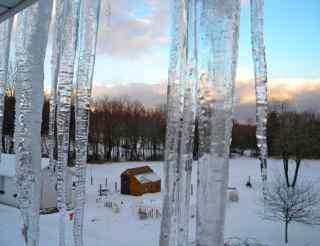 I loved the little icicles that hung down from the gutter on the low schoolhouse roof. We would break them off and pretend they were lollies. 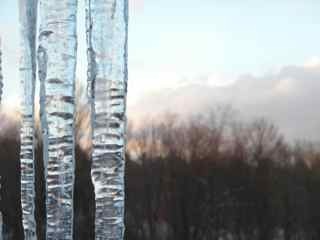 Pennsylvania icicles are another matter; they are enormous stalactites that can inflict a great deal of damage when they fall. 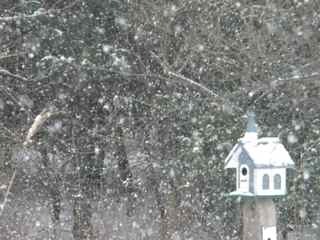 In fact, it seems to me that everything about a PA winter is 'another matter'. Or have I become a Winter Wimp? I will not brave the cold outdoors unless absolutely necessary. I sit by the warm fire in the den, or in my comfy, garden-room armchair, and admire the snowy views through windows. Last summer, I blogged about the views from my windows (See A Room With a View for June's Garden Bloggers' Bloom Day.) Then the scenes were full of bright colors. Winter views are quieter; my photographs are black and white instead of color. 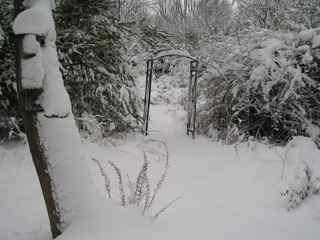 When the garden is covered with snow one should not only admire its beauty - you can now see the REAL BONES of the garden. This can be a useful tool for planning, or changing, your garden design. 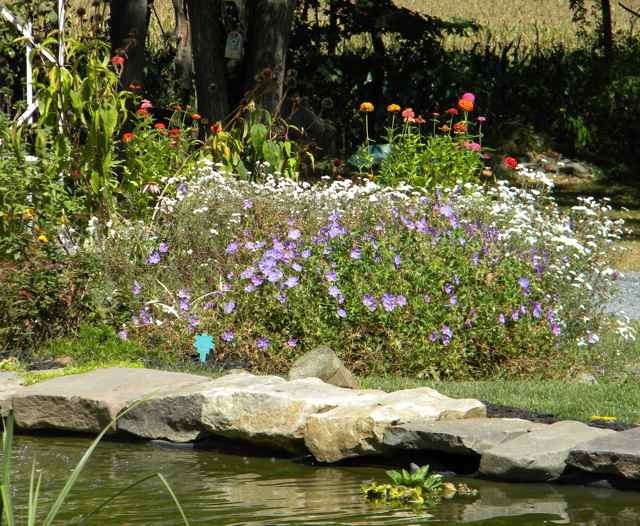 For this reason, when I teach a class on garden design I like to begin with the winter garden. 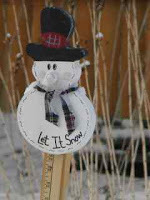 I like to talk about the importance of structures, plants, and ornaments to make the winter garden more interesting. 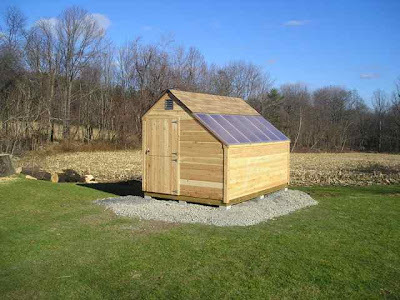 Structures include arbors, sheds, and fences. 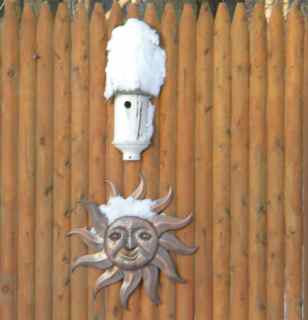 The arbor in the picture above leads you into the woodland walk. 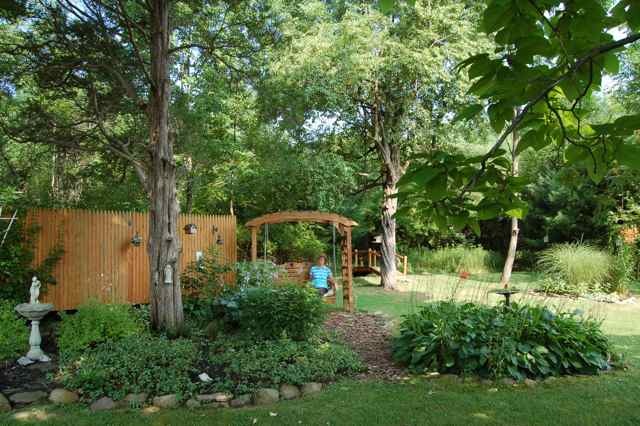 I can see this arbor, and the bridge over bluebell creek, from the garden room window. Other important structures in my garden include various fences. 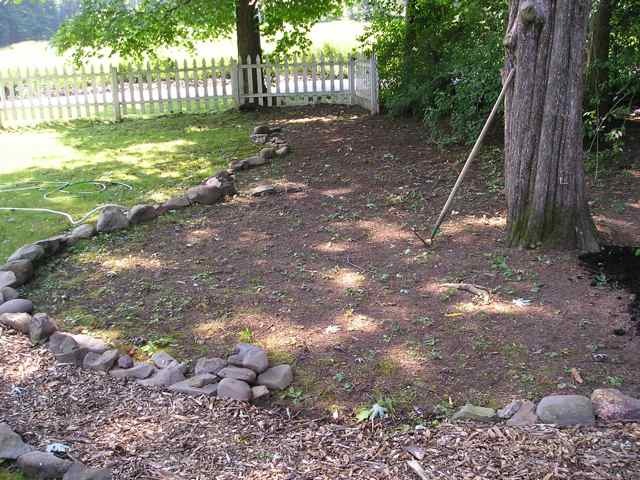 An unusual structure is a pile of large rocks in the pasture. H.H. had then placed there to give the goat somewhere to climb. 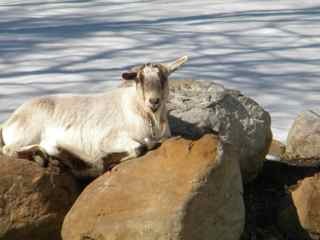 Billy loves to lie on the rocks in the sun when some of the snow has melted with the January thaw. 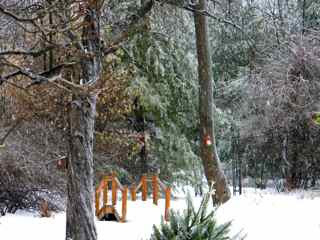 Grasses and trees provide winter plant interest in my Pennsylvania garden. 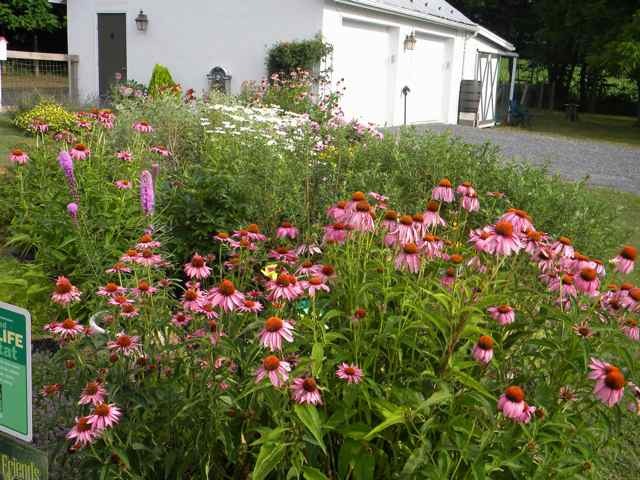 I am keeping some of those pictures for the next Garden Bloggers' Bloom Day. 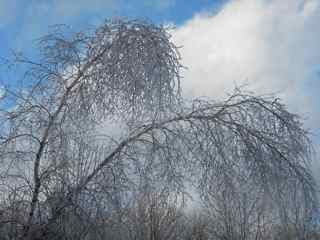 But I must show the beautiful white pine that bows down with the weight of ice after an ice storm. The trees between the pasture and the woodland garden are both deciduous and evergreen. They display snow and ice in interesting ways. It is important to leave some garden ornaments outside in the winter as long as they wont be damaged by the harsh weather. 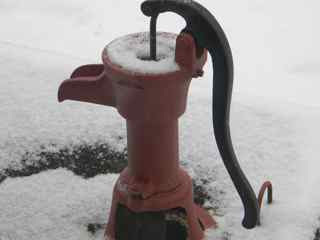 I put a lot of mine in the basement for protection, but leave out a few, such as the old water pump. 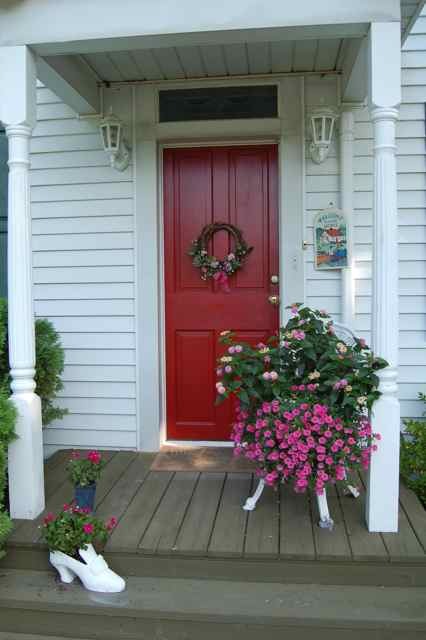 It's bright red paint provides a warm splash of color. 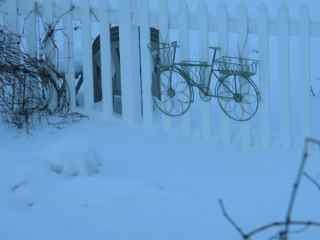 The metal bicycle (plant holder) on the picket fence is ghostly in the snow. 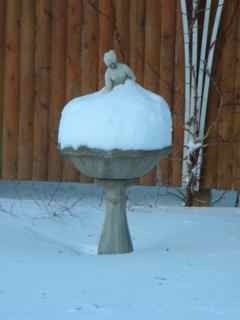 The naked lady (as my grandson calls her) soaks in a cool bubble bath. 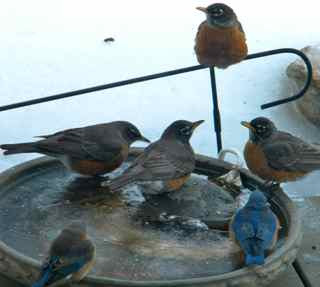 Finally, as you know, it is important to provide shelter, food, and water for the birds in the winter garden. H.H. 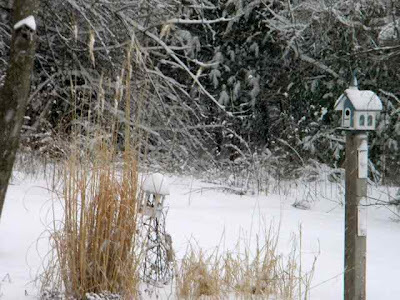 places numerous bird houses in every corner for our feathered friends. 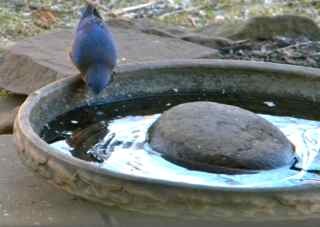 The bird house below is occupied by bluebirds. The one on the fence is shelter to a wren. H.H. 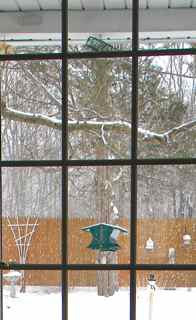 hung a bird feeder from a branch of the catalpa tree outside the garden-room French windows, and he placed a heated water-dish on the porch there. 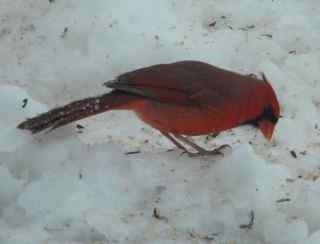 Birds provide the BEST colors in the snow-covered garden. 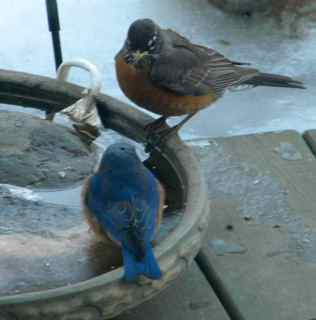 My favorite are the bluebirds. A good garden designer plans how the winter garden looks from each window. I am sorry to say I did little planning originally, but I can now see where I should make changes. I recommend you observe your winter garden with the following elements in mind: structures, plants, ornaments, and of course color. 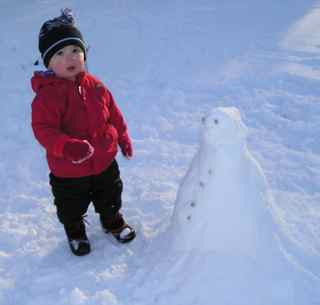 In conclusion, I prefer the warmth inside my house, but one thing will make me venture outside ... building a snowman with a grandson. Yes, my garden definitely has four seasons of interest!